Faith and Word of God are powerful weapons to defeat the enemy and unlock the power and glory of the Kingdom of God in your life. As born-again believer you must understand how to develop and exercise your faith to possess everything God has for you. We must constantly feed or refresh your faith to stay "...strong in the Lord, and in the power of His might" (Ephesians 6:10). 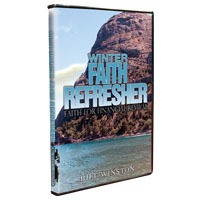 Let the revelation and wisdom shared in this power-packed conference compilation help you to usher in a new season of Kingdom manifestation into your life as you build, exercise and refresh your faith!